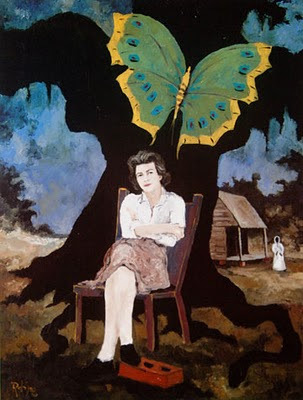 George Rodrigue’s paintings of women focus on both myth and reality. In most cases they include strong women with important roles in their community, Louisiana’s cultural history, and their own families. 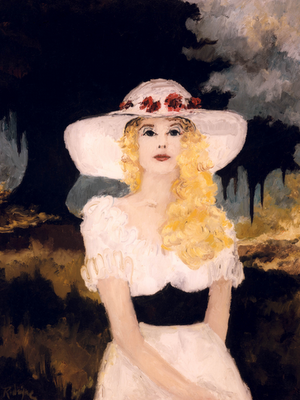 He paints these Cajun women in his typical fashion, shining like ghosts beneath the oak trees. 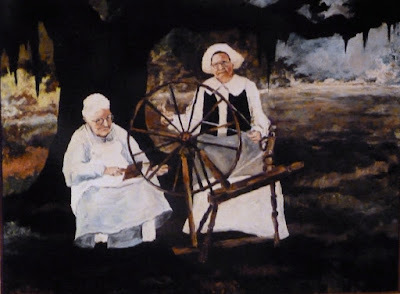 They perform activities such as sewing and cooking, cultural characteristics and traditions that George saw fading and felt compelled to preserve through his art. This visual record includes an ambiguous timeline. 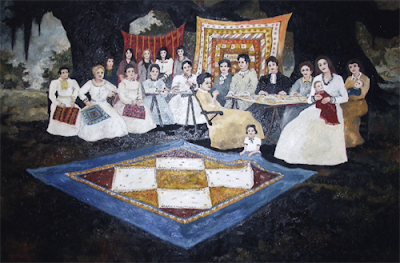 For example, in the painting The Patchwork Gift (1978, 48x60, pictured below), George painted a typical quilting party from 1950s New Iberia. Yet he dresses the women in earlier clothing, nineteenth or possibly eighteenth century, so that the figures embody a long cultural tradition as opposed to a specific event. Quilting parties were a common Cajun tradition for years, especially at the church fair. Ladies worked on quilts stretched between thin sawhorses as they displayed their finished pieces for sale, raising money to benefit their church and community. 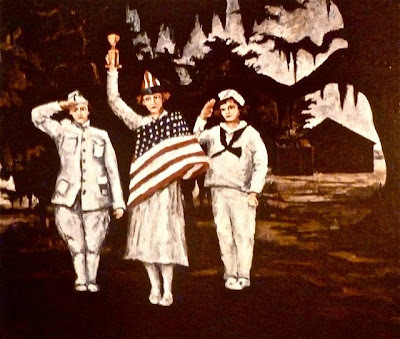 In addition, The Patchwork Gift, similar to Miss July 4th of Carencro (1977, below), is an excellent example of George’s focus on locking his subjects into the landscapes, an important aspect of his style ever since The Aioli Dinner of 1971. The women’s heads never touch the sky, but rather are framed by the oak trees and handmade quilts that help define their culture. Evangeline, as described in the epic poem by Henry Wadsworth Longfellow (pub. 1847), is the quintessential Cajun female visionary. 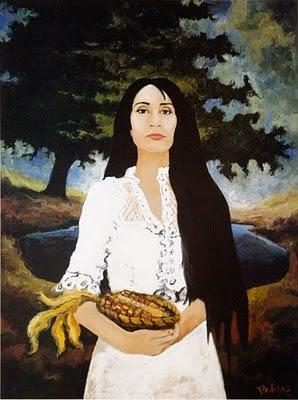 She represents the Acadian Grand Dérangement of 1755, as she searches for Gabriel through the bayous of south Louisiana. George has painted her many times, always seeking and pensive, not only looking for love, but also for a new home following the persecution of her culture and religion. 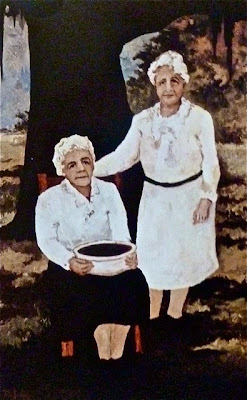 For George, the women in his family, such as Tante ‘Gite, pictured below with Cousin Mausolite in a painting from 1979, retain an importance as significant as Evangeline. When I asked him about Women of Vision in his paintings, he named his aunt first, explaining that she made an excellent gumbo. “I watched the Cajuns of my childhood assimilate into the American culture, unable to remain isolated in the modern world. I show this graphically by blending the Acadians’ clothing with the trees and ground. 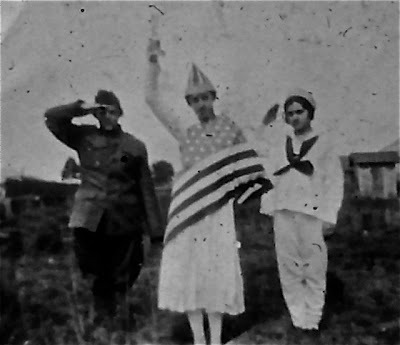 Tante ‘Gite holds her famous gumbo in her lap, but her dress is part of the earth, and the gumbo is a part of her.” –G.R. George painted other Women of Vision in a contemporary fashion unrelated to the early Acadians. New Orleans author Shirley Ann Grau (b. 1929) won the Pulitzer Prize for her novel The Keepers of the House in 1965. The images in the painting reflect symbols from her various novels and short stories. Mahalia Jackson (1911-1972) is the undisputable queen of gospel music. A New Orleans native, she found initial fame in Chicago, where she sang as a soloist at churches and funerals, eventually touring with Tommy Dorsey and recording with Columbia Records. 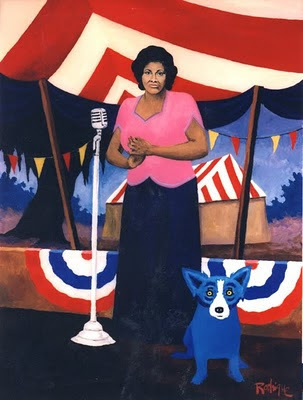 George painted Mahalia Jackson for the 1996 New Orleans Jazz and Heritage Festival. Although the poster fell through, replaced by his painting of jazz great Pete Fountain, the painting remains an important record of an American Woman of Vision. From George’s home area of Lafayette, Louisiana, former Governor Kathleen Blanco (b. 1942) qualifies as well. 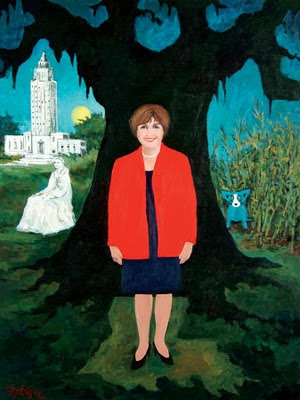 George’s enthusiasm for Blanco’s election in 2004, resulting in the first female governor of Louisiana, spilled over into his portrait of his long-time friend. 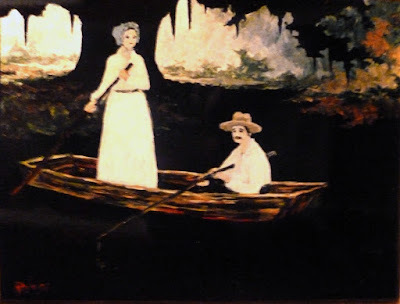 He paints her in the tradition of his earlier portraits of Louisiana Governors Huey Long, Earl Long, and Edwin Edwards, with several added elements from the Cajun culture shared by both George and Blanco. This includes a seated Evangeline statue, as well as the loup-garou hiding within the sugarcane. Finally, although I wouldn’t necessarily call them ‘Women of Vision,’ simply because their paintings are more culturally symbolic than they are portraiture, Jolie Blonde and Evergreen Lake are important female protagonists on more than one hundred Rodrigue canvases, and I would feel remiss if I didn’t share at least one painting of each. This post does not come close to showing all of the Women of Vision in George Rodrigue’s paintings. However, it does hit some highlights --- both my favorites and his. 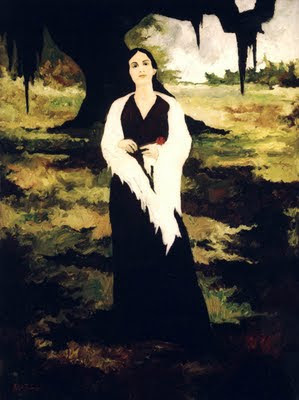 In the end, I think it is the simple Cajun woman, timeless, and living among the bayous and oaks (the Swamp Woman! ), that appeals to both of us the most. I developed this essay in thinking about my upcoming lecture* at the University of Louisiana at Lafayette for their series ‘Women of Vision.’ Now that I’ve worked it out, however, my speech will have little to do with what you read here, focusing instead, at George’s urging, on my own search for identity, as well as the unexpected life’s wonders that lead me here.